Day two and we’re fully immersed in what is already the most interesting and somewhat surreal soccer experience of our lives. There’s been enough excitement, interesting sightings, bizarre décor, and soccer action for an update in the first 24 hours. So here we go! Our flight from Philly to Dallas was a blast for Justin and his teammates. Arriving at the hotel, it didn’t take long to see teams and coaches from Manchester City, Liverpool, and other clubs. We dropped our bags off and ran off to a field next door for a brief training session. Our counterparts on the training field? Atletico Madrid’s ’05 academy team. As both teams wrapped up, it quickly became a fantastic photo opportunity as the two teams mingled. From the training field, back to the hotel for dinner, then a shuttle ride over to a field house for Opening Ceremonies. 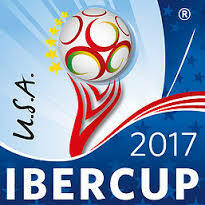 There are 200+ teams here this week from 17 different countries, which is the highest number of countries to attend IberCup USA to date. In addition to teams from North America, Central America, South America, and Europe, there are teams who traveled halfway around the globe to be here from Australia and South Korea. The ceremony had a showcase video with pictures of all participating teams, a guest speaker, marching band, and, of course, some country/western dancers. Night time back at the hotel consisted of players knocking the ball around the dance floor, while parents and coaches caught up at the bar. Special guest appearance? Dwayne DeRosario came over to get some food and a drink, and was gracious enough to chat with a few of us for a while. A solid night all around! The tournament schedule is surprisingly spread out, with only one game per day for most teams. We arrived at the Ross Stewart Soccer Complex, home of the Dallas Texans soccer club, for our 11:00 a.m. game. First, it’s an amazing complex, with immaculately-kept short grass fields. They really are great fields for a tournament like this one. Justin’s team, CFC Dortmund White, opened up with Rayados Innova from Mexico. Christian opened up the scoring early and then came my proud dad moment: A long corner kick cleared all players, but was run down by Nate and chipped back across from the left. Justin managed to get his right foot on the volley, finding the back of the net! A slick layoff from Jason to a streaking Cavin put Dortmund White up 3-0. A late goal from Rayados from a clearly offside position (no offside rule in this tournament) made the final a 3-1 victory for Dortmund White. CFC Dortmund Black then took the field against Verona, a team from Columbia. Dortmund Black pounced early and often, then cruised to a 13-0 shutout. A celebratory team BBQ lunch downtown at Pecan Lodge ensued, then back to the hotel for more dance floor soccer, of course. Camaraderie – The Atletico Madrid photo shoot with our Continental teams was everything that’s awesome about sports. The opening ceremony really did have an Olympic feel to it, with teams chanting and singing, and flags hanging and being waived proudly by players from every represented country. One of the Dallas Texans girls’ teams called our boys over for a group photo. Kids bonding over soccer everywhere you look is really cool to see. And what a team bonding experience too: Team lunch, our teams watching each other’s games, soccer in all corners of the hotel, pool time, and much more. The Hotel – For those who knew and remember Pulsations back in the day, flash back to that place, minus the robot. There’s odd, really small checked tile everywhere, really gaudy chandeliers, blue neon noodle things coming up out of half walls, gold pleather couches with faux diamond buttons. Even the nice looking poolside cabanas have odd pink chandeliers hanging inside. It’s American Horror Story: Hotel, but no odd vampire sightings yet. Beyond bizarre. There’s either no renovation budget since 1982 or this look became their calling card. Oddly, it’s added to the fun. Competition – For starters, the rules are different than what U.S. Youth Soccer carefully and deliberately introduced this past season. The build-out line? Scrapped. Offside? There is no such thing. And heading is allowed for this week. The offside rule in particular really changed the approach to the games today and, other than making the single referee’s job a bit easier, I just don’t get it. While we expect a tougher matchup tomorrow with one of the local Dallas Texans teams, we’re excited for today’s great start for both CFC teams. Pulsations on a Sunday night. Yes, I remember. I don’t remember popcorn, but definitely had some good times at Pulsations back in the day! Travel soccer is one of the best things for kids to forge friendships with their teammates forever. But I think your age groups are too young to travel to this expensive tournament. We always had long discussions up to U15 whether or not to participate in this Dallas tournament; we never did due to the high cost even though we were invited. Later we travelled to the Disney tournament and many others. Looking back I am glad we saved some money when my son was that young since once he get older enough money was spent on other tournaments and travel.